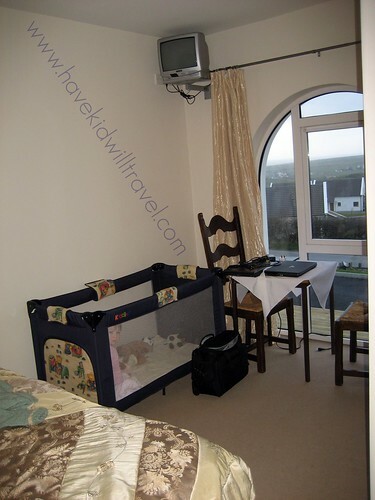 Our final days in Ireland were spent in the wonderful rooms of Harbour View B&B in Doolin. 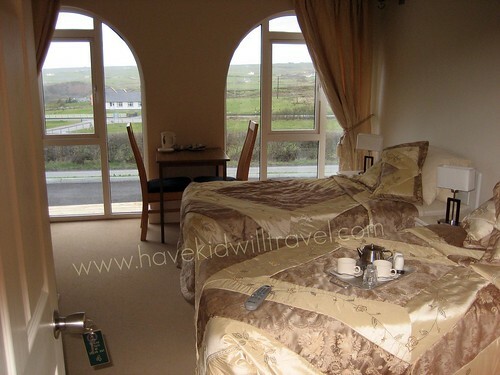 Harbour View is a purpose built B&B and all I can say is: what a great job they did! You can tell just how much thought went in to making this an inviting guest house. The rooms are spacious and comfortable with large en suite bathrooms. All rooms are on the ground level and many have a great view looking over the town and out to the ocean. Cathy Normoyle, your gracious hostess, says you can see the Aran Islands on a clear day. (We didn’t have a clear day when we were there so I can’t claim to have seen them). Most of the bedrooms sleep two and a couple even sleep three. The beds were very comfortable and a cot is available upon request. All rooms have coffee and tea service and a lovely sitting area for gazing out the large windows at the breathtaking view. Upon entering you will see an inviting sitting area with a large TV and fireplace. When we were there Cathy’s beautiful son was enjoying Nickelodeon- my girls hadn’t seen Dora in almost a week; they were overjoyed! The dining area is through the sitting room and toward the back of the house. It is a lovely open room with a center buffet of cereals, cheeses, yogurts, fresh baked breads or scones, milk and juice. Cathy serves a full Irish breakfast that will keep your energy up well in to the afternoon. There is no highchair available, so be sure to bring your trusty travel booster. Harbour View is an easy hour from the Shannon airport so it makes a great final location for your travels and Doolin is a wonderful base for touring the Burren. 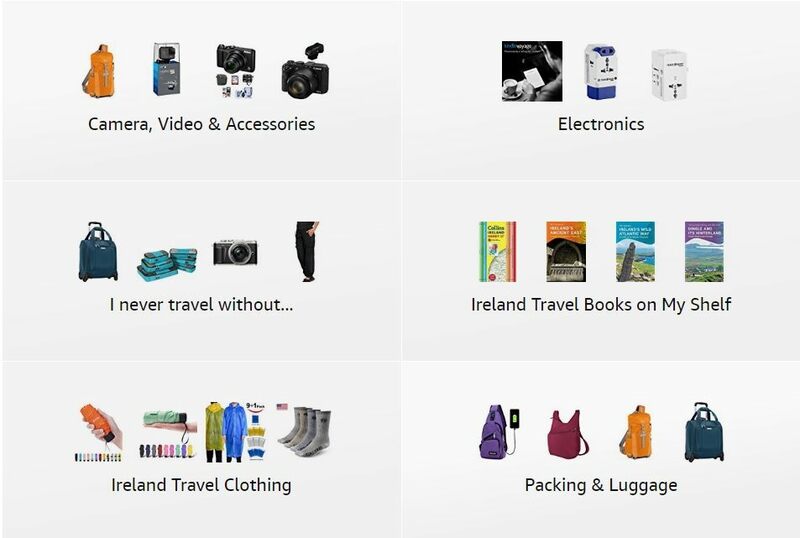 Burren is derived from the Irish word boirreann, meaning a rocky place and, well, the description is spot on. I actually joked with Doug that this is the place they grow the rocks for all the stone fences in Ireland. Plan the better part of a day to meander through the rocky landscape. You’ll want to stop at Polnabrone Dolmon and marvel at the strength it must have taken to maneuver the rocks into position. The sheer size of this tomb is difficult to imagine until you stand beside it. 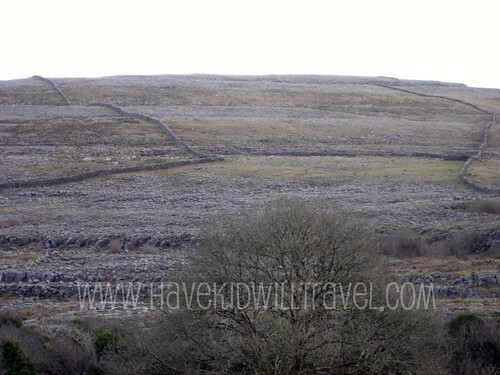 This is the most accessible dolmon in the Burren so you may see a lot of tour buses. They don’t stay long and tend to be on similar schedules so wait them out for a less crowded self tour. 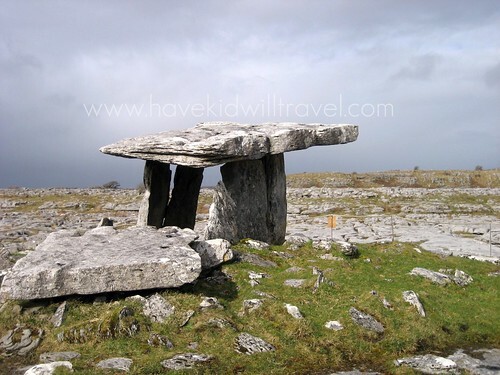 The Burren has hundreds of megalithic wedge tombs, dolmons and ring forts, so a visit to Burren National Park is worth your while. A great stop while in the Burren is Lisdoonvarna, famous for it’s matchmaking festival every September and the Spa Wells Heath Center with it’s Victorian pump room. If you haven’t viewed any round towers the Kilmacduagh Monastery near Gort should definately be on your list. Even if you have the history of the settlement and the legends that surround it are worth your time. 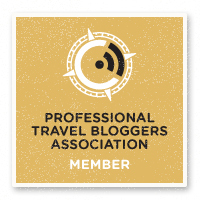 A note from the linked website: Visitor’s are encouraged to begin their exploration by walking over to Tower View Villa B&B across the street to get the master key for the locks on the buildings. There is a 5 deposit and a short history of the site is available from the innkeeper, Lily, for 2.50. Grab a copy of this guide before getting started. It will be invaluable as you wander through the buildings. Once back in Doolin you have quite a few amusements to keep you occupied. I highly recommend at least one evening at Gus O’Connor’s Pub. If you visit during high season you’ll find music every night. Otherwise you may have to wait until the weekend. But Doolin is known for it’s traditional Irish music so you won’t be disappointed. The musicians sit in a booth- it’s called a session- which makes it very informal and easy to join in. There is no set time so try some of the best fish & chips I’ve ever tasted or the huge bowl of steamed mussels, grab a pint, join in the craic and relish in a true pub experience. Because it is a pub you will not be waited on. Head up to the bar to make your drink and food orders (and to grab menus) and chat with the bartender. If you have nice weather spend some time wandering through Doolin and stopping in the craft and jewelry shops. And don’t pass by the music shops- this is the heart of Irish traditional music. 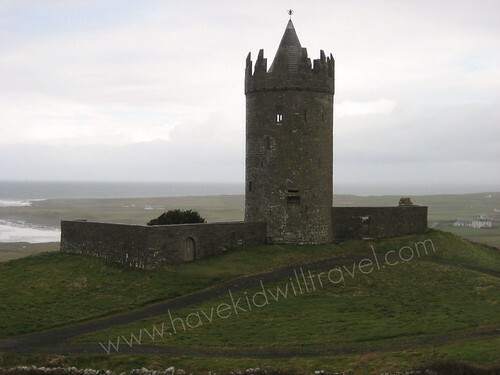 If you are heading to the Cliffs of Moher from Doolin you will surely see Doonagore Castle on the edge of town. This gorgeous 16th century tower house is privately owned and, therefore, not open to the public. It’s absolutely stunning and on a sunny day the reflection from the tiles on the conical roof are brilliant. Hi there, this is Thomas Marshall, brother of Debbie Cooley. This is wounderfull and has made me fall in love with this country. I have allways wanted to go, and now I can afford it. I will send you an email back.